View More In Figurine Ornaments - Page 2. Collect this Christopher Radko Disney Enough For All Christmas ornament, 1997. Wearing his red suit, Santa unexpectedly emerges from a purple quilted bag is trimmed in gold and covered withl golden shooting stars. Spilling out of the bag are a toy sail boat, school bus, log cabin house, yellow school bus, other toys and wrapped presents, each beautifully detailed. Standing approximately 7 inches tall by over 5 inches wide, the ornament has outstanding presence and is a terrific find! Christopher Radko "Enough for All" Ornament, Disney Exclusive, limited edition 500, hand-blown & handcrafted Polish glass Christmas Tree Decoration, 1997, 97-209-DW). 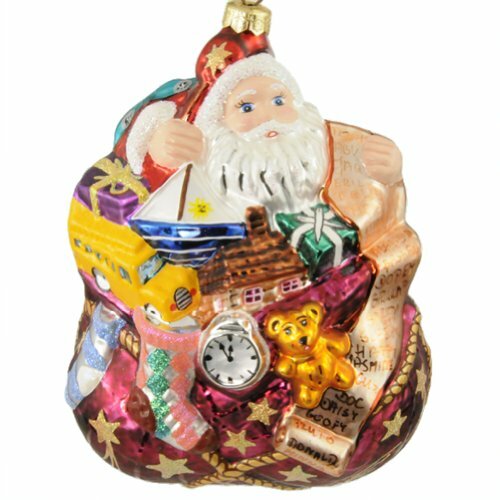 Collect this huge, spectacular, hard-to-find Radko Disney collectible glass ornament now! Produced as a limited edition exclusive of 500 pieces for the 1997 First Ever Christmas Collectibles Convention, held at Walt Disney World, Orlando, Florida; the original hangtags are hand-numbered. Santa holds a list with quite a few Disney character names -- it will indeed be a wonderful Walt Disney World Christmas! Standing approximately 7 inches tall by over 5 inches wide, the ornament has outstanding presence and is a "must" for the Disney and Radko collector. If you have any questions about this product by Christopher Radko Ornaments, contact us by completing and submitting the form below. If you are looking for a specif part number, please include it with your message.